Oh, mylANTa. The Civil War in Germany changed a lot of things for a lot of superheroes. For Scott Lang, AKA Ant-Man (Paul Rudd), his efforts in helping Captain America earned him a two-year stint of house arrest. He bides his time playing drums and being a great father to Cassie (Abby Ryder Fortson). His actions not only affected him, but those who gave him the La Gigante/El Pequeño powers in the first place. Hope (Evangeline Lilly) and her father, Hank (Michael Douglas) are on the mend as well, though they haven’t been sitting idly. In their time, they’ve been busy constructing an instrument that leads to an opening in the quantum realm. What’s in the quantum realm? Potentially, Janet (Michelle Pfeiffer), the wife of Hank and mother of Hope. To bring her back into their realm, they will have to traverse this unknown space, possibly with the help of Lang. Standing in their way is a black market dealer in Sonny Burch (Walton Goggins) who sees the profit that could be had on their apparatus and will exhaust all methods to acquire it. Know who Marvel Studios is? The Golden State Warriors—aka a dynasty. Bear with me for a second. You’ve got Stephen Curry in the form of Iron Man and Captain America (the foundation piece(s)), Klay Thompson as Thor and Hulk (the 1A players that can star in stretches but do better with an ensemble), Kevin Durant as Spider-Man (the megastar and possibly best player who bolted his old team/studio for another, more stable one), DeMarcus Cousins as Doctor Strange (arrogant but extremely talented character/player), and Draymond Green as Black Panther/Peter Quill (perhaps not the most skilled players, but often the most compelling ones who serve as the heart and soul of their teams). OK, maybe not perfect comps, but all of this is to say that dynasties are often flush with talent, but the talent has tiers. 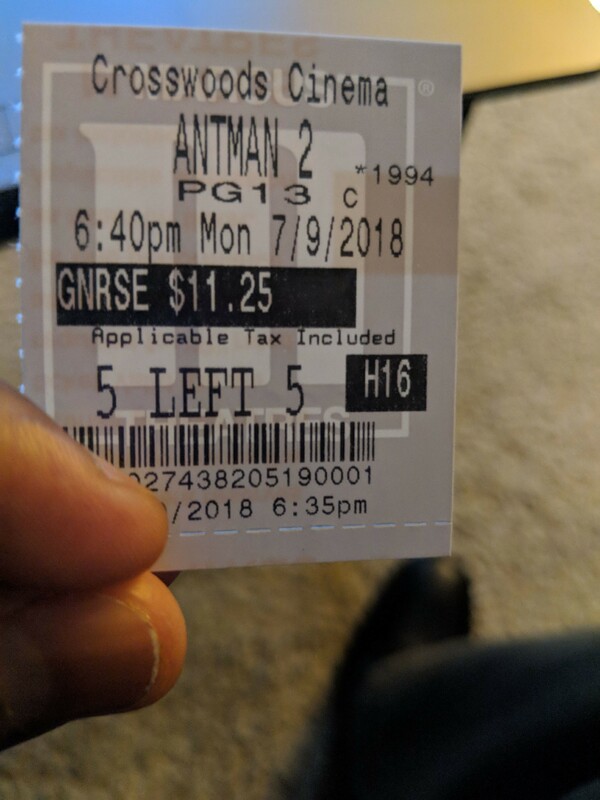 After two movies, Ant-Man is not Hawkeye/Zaza Pachuila inconsequential, but more of the 7th-8th-9th most important player who is just gravy on top when he’s sinking fire shots. So, Patrick McCaw? After the chaoticness in the directorial seat that the first movie saw going from Edgar Wright to Peyton Reed midway through production, Ant-Man and the Wasp sees a much smoother production spearheaded by Reed from the moment a sequel was announced. The best thing about the titular hero’s movie is easily the unique and inventive action sequences utilizing scale…or the lack of it. No, Ant-Man doesn’t feature the technological marvel of a Black Panther world, the visual trippiness of the recent Thor or Doctor Strange (although Ghost’s ailment visually qualifies), or the sheer massiveness of a Avengers flick. But, it’s subversive in it’s own way, and in a genre that can feel the same from a set piece perspective at times, Reed manages to keep it entertaining. If anything, there may be a higher level of craftsmanship going on here than those movies, as in the wrong hands, the juxtaposition of size would look horribly out of place. After two films, the approach Ant-Man takes into the MCU is easy to see. Where everything else fits snugly in a Marvel jigsaw puzzle, Ant-Man requires a little extra force to fit that piece in. That’s admirable and welcome, I just personally wish there was a script worth investing into that balances humor—which Rudd and co. do well—and stakes of the smaller variety. As a comedy? Ant-Man and the Wasp is in the top rung of Marvel’s offerings in how easily it gets laughs, a byproduct of Paul Rudd’s likability, delivery, and timing. The efforts of Douglas, Fortson, Randall Park, Anthony Peña, T.I., and David Dastmalchian are not to be forgotten though. As a family drama? The desire Lang has to be there for his daughter first and foremost is cute, but the mission of traversing the Quantum Realm to find Janet is somewhat flat and underdeveloped. That too goes for the relationship of Lang and Hope, which happens offscreen between the period of Ant-Man and its sequel. The duo possess some chemistry to offset this somewhat, yet seeing their relationship actually progress would have been helpful, à la Tony Stark and Pepper Potts. Like that perfect bit player on a team required to only hold down an inning or two or a few minutes here and there, Ant-Man and the Wasp occasionally flashes superstar potential. But mostly, it’s content to be a supporting player and fills that role pretty competently. Photo credits go to ign.com and simplytodaylife.com. It’s interesting, I actually liked it more because it felt like a supporting player with smaller stakes. I found it to be a welcomed breather after larger-scaled MCU movies of late. And I say that as someone who wasn’t the biggest fan of the first movie. Interested to see how it holds up after a second viewing. I think I’m in the minority on this one. It’s impressive as a production but for me, I was in and out interest-wise for a good chunk of the film. It’s not bad. It’s good. Was just not as interesting for me as I hoped. But, I believe I’m in the minority. Coming after Infinity War this feels like an expendable entry in the MCU. The story is so lightweight. Still, that is a refreshing strength given them riodculusos stakes of the last film I enjoyed this, but it’s not anything I’m going to remember a week from now. Outside of the mid-credits scene and the few small-big sequences, I’ve already forgotten it lol. But you’re right, it is a little refreshing.